them happy and busy. Please let me know if you find about anything interesting going on that I might be interested in. So now, I am doing my research on hotels and where I will get the most bang for my buck. I plan on taking advantage of as many hotel promotions as possible. To be able to pay for these hotel stays, I will be signing up for more credit cards and might cash out some money from them. I will keep you updated on my next App-o-rama. I've noticed that there are alot of hotel promotions going on now! I've already told you about Club Carlson's Promotion a couple of weeks ago and now I will mention the promotion's going on with Hilton and Hyatt. 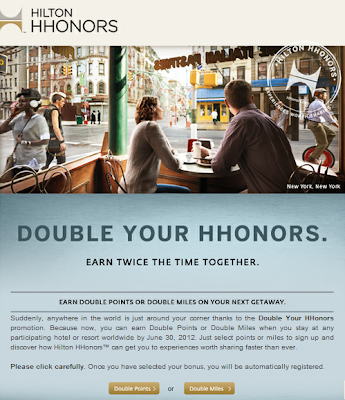 This June, when you stay at any Hilton you can earn either double points or miles. But there is an even better deal going on with Hyatt! Stay at any Hyatt Hotel between May 1, 2012 - August 31, 3012 and earn 5 times points or miles! Receive exclusive benefits after your 5th stay with a Hyatt Gold Passport ® Platinum status upgrade. You can choose to earn miles on any one of these airlines, but you can only earn on 1 airline no matter how many stays you have. One normally earns 500 miles per stay per night, with 2-3 stays that would be 2,000 miles per night and for 4-11 stays it would amount to 2,500 miles per night. If you took full advantage of this offer and stayed at a Hyatt Hotel for 11 stays, you would earn 26,000 miles on one of the airlines below! Receive 1 free night during your stay through December 30. Minimum length of stay required, varies by property. Receive 1 free night during your stay from June 21 - September 8. Minimum length of stay required, varies by property. Do you know of any great prices at a Club Carlson or Hilton hotel in the NY/NJ/PA area? If you do, please comment below.